A collection of 48 Facial Expressions for Genesis 8 Male. 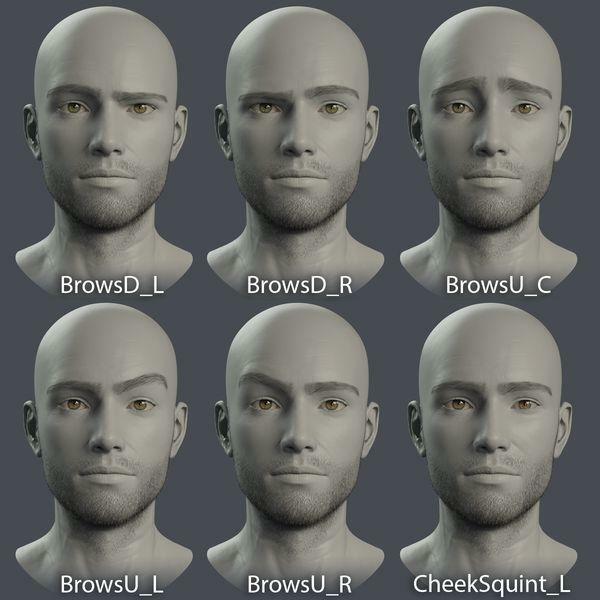 Custom sculpted based on FACS (Facial Action Coding System), these expressions will add additional realism to your facial animations or poses. Use individually, or combine with other expressions for increased flexibility. Originally optimized for Faceshift with 1 to 1 mapping for easy import, but can be used for many other purposes. PrinceAlucard (5 weeks ago) Inappropriate? IronHide78 (5 months ago) Inappropriate? caravelle (5 months ago) Inappropriate? android65mar (5 months ago) Inappropriate? Faeryl Womyn (5 months ago) Inappropriate? yeiyn48227 (6 months ago) Inappropriate? andolaurina (6 months ago) Inappropriate? Great work! Hope you do these for G8F, too. Thank you so much!!! Moy Kot (6 months ago) Inappropriate? Ivy (6 months ago) Inappropriate? albino (6 months ago) Inappropriate? MysticArtDesign (6 months ago) Inappropriate? mininessie (6 months ago) Inappropriate? Gisellegg (6 months ago) Inappropriate? Teri Perkins (6 months ago) Inappropriate? AstReiner (6 months ago) Inappropriate?